The 2017 Roger Albert Clark Rally will feature a transport section for the first time when the rally re-locates from Leominster in Herefordshire to Carlisle on the evening of Friday 10 November. In what is believed to be the first time a transport section will have been used in British stage rallying, the competing cars can be loaded onto trailers for the journey following the end of the event's inaugural Welsh leg on Friday. The rally will re-start from Carlisle at 9am on Saturday morning, thus ensuring that all competitors and service crews can make the journey north and have an overnight break before starting day two of the rally. Some crews will head straight to Carlisle on Friday evening, while others may choose to break the journey in the middle or even head home if they live somewhere between the two rally bases. Competing cars will be subject to re-checks by event scrutineers shortly before the Carlisle re-start. Rally manager Colin Heppenstall said: "It makes perfect sense to allow competitors to load up and tow the rally cars to Carlisle. It is more economic and makes for an easier journey than a long road section in a rally car." There will be a service area at Brightwells in Leominster at the end of the Welsh leg and crews will be free to plan their journey to Carlisle to suit their own needs. After the service-in control at Leominster, the next control will be the re-start control at Carlisle on Saturday morning. 17th May 2017: Route details announced for the Roger Albert Clark Rally 2017. Finally we can reveal the news everyone has been waiting for. The full route for the return of this "must do rally" has been announced. Click here for the full route information. 16th May 2017: Shelsley Walsh for Roger Albert Clark Rally. The Roger Albert Clark Rally in November will be utilising the world renowned Shelsley Walsh Hillclimb as it's start venue. As well as the ceremonial start , it will host two spectator stages on the Friday morning. Before the rally heads into the Welsh forests for the opening day of action, the cars will tackle two special stages on the famous hill climb course near Worcester. 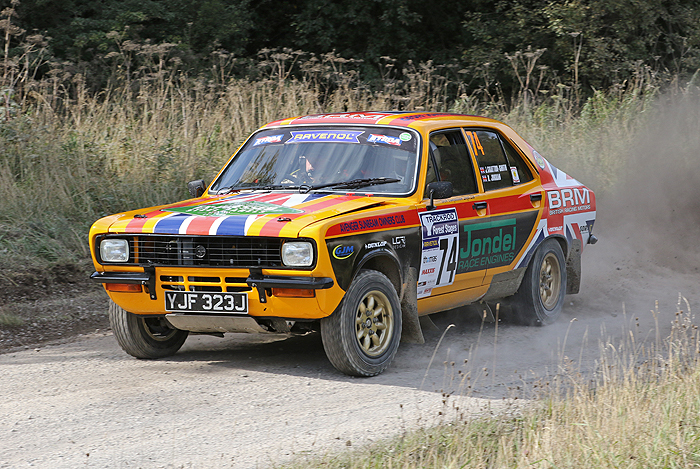 It is believed to be the first time in the venue's 112-year history that it has hosted a rally special stage and will also be the first time that Shelsley has been used competitively downhill. Following event documentation at Brightwells in Leominster, the rally cars will gather at Shelsley Walsh for the start of the rally at around 9am on Friday. The cars will tackle two special stages, both run at 30-second starts. After the pair of Shelsley Walsh stages, the rally cars will have a short service halt in the main paddock and a re-group control before heading into the Welsh forests. The opening stage will run from the hill startline to the finish and the second will run back down the hill before turning left at Kennel Bend to finish on the gravel access road across the top of the main spectator car park. Several chicanes will be added to the hill to control speed on the descent. Cars will complete both stages in batches of up to 30 cars to ensure non-stop action for spectators. Shelsley Walsh is the world's oldest motor sport venue using its original course and was first used in 1905. However, this November will mark a first in the history of this world-famous venue with the Brightwells Shelsley Walsh Hill Climb Special Stages. "We're delighted to be starting the competitive action of the rally at this iconic motor sport venue," said rally manager Colin Heppenstall. "It is the perfect location for spectators to come and see the action and we think it will add a real sense of occasion to the event's first visit to Wales and the Welsh Borders. I'd like to thank Mark Constanduros and the Midland Automobile Club for making this possible." Mark Constanduros from Shelsley Walsh said: "We are really delighted to welcome such a prestigious rally to Shelsley Walsh. This is the first time we have held a competitive rally at the venue, so there is a lot to do, but we are really looking forward to having a different motor sport discipline taking place here. Last year we had Group B rally cars, this year we have Group A and WRC cars and now the year will finish with historic rallying: I can't think of anything better!" 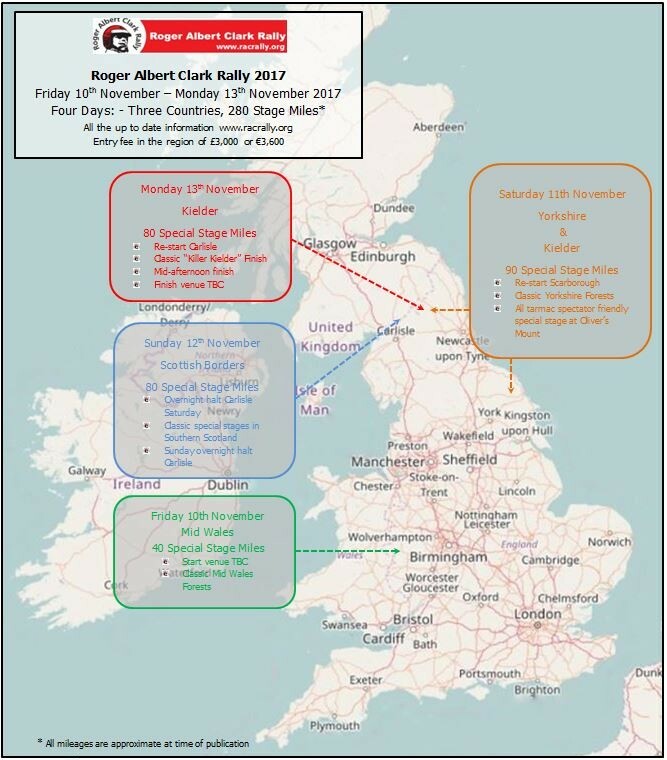 The complete route for the 2017 Roger Albert Clark Rally, along with event regulations, will be launched on Wednesday 17 May. The route survey for the returning Roger Albert Clark Rally has started, however there are still lots of details to be sorted out but we are well on our way to compiling our most adventurous route to date. It is too early to quote specific information as yet with much to sort out over the next few coming weeks, What we can say however is that the weekend was a great success in terms of looking at a start venue and a number special stages, including a really interesting possibility for a spectator friendly stage to open the competitive action. The plan is to make the Welsh leg a proper challenge with a good proportion stage mileage to get the rally off to a cracking start. What is certain is that this will be the first time in twelve years that the rally has been so far south and we are really looking forward to making the Roger Albert Clark Rally accessible to those in the Midlands, the South and, of course, Wales. Thanks are due to several key people for their help and support to date: they know who they are. As soon as we can tell you more, we will, so watch this space! Don't forget you can see the outline route map here. One historic rally crew will win a free entry for the Roger Albert Clark Rally in a prize presented by regular competitor Barry Jordan and his businesses, Jordan Road Surfacing and BRM Competitions Dept. Ltd. The winning crew in this year’s Northern Historic Rally Championship will receive the award, worth around £3000, in time to compete on the re-launched Roger Albert Clark Rally (10-13 November). The unique prize is one of the biggest in UK stage rallying. The Roger Albert Clark Rally Motor Club Ltd has unveiled the most extensive and far-reaching route in the event’s history for the 2017 edition, starting with more than 40 stage miles in Wales on Friday (10 November). The route then heads to Yorkshire, Scotland Kielder as it takes in around 280 stage miles. Barry Jordan said: "Myself, Peter and James of BRM Competitions Dept. Ltd are pleased to be able to offer such an amazing prize of a free entry on the Roger Albert Clark Rally 2017. We are hoping that by providing this prize it will help boost the Northern Historic Rally Championship and also promote the return of the Roger Albert Clark Rally." Rally manager Colin Heppenstall said: "This is an incredible award and we are very grateful to Barry for supporting the prize. We hope it will give a deserving crew the chance of a lifetime to compete on what we are planning will be the biggest and best Roger Albert Clark Rally to date"
See the outline route map here. 18th January 2017; Roger Albert Clark Rally route unveiled. Continued...Speaking to MN at Autosport International, Rally manager Colin Heppenstall revealed that the rally will open with around 40 stage miles in mid-Wales from a base in the Welsh borders. Saturday’s route will include the classic Yorkshire forests before heading north and west into Kielder in a day covering around 100 stage miles. Sunday’s route will take in famous stages in southern Scotland before a final 80-mile leg in the main block of Kielder forest on Monday ahead of a mid-afternoon finish. The draft route contains around 280 stage miles. Negotiations are on-going with towns and cities for the event start, overnight halts and finish and the route is likely to take in several spectator-friendly special stage venues including the asphalt stage at Oliver’s Mount near Scarborough. Heppenstall reported a very busy show as many prospective competitors made serious enquiries about the event. “The fresh format, and the plan to run the event every other year, seems to have really captured everyone’s imagination,” said Heppenstall. See the event outline map by clicking on the map opposite, or click here.